Camping trips are one of the best parts of summer, but it's not always easy to pack nutritious foods. Here are my top picks for portable healthy meals and snacks. Summer camping trips call for s'mores, hot dogs, boxed macaroni and cheese, chips and chocolate bars tend to be the go-to options for convenience. The catch? These sugary and salty options leave you feeling low energy and bloated. At worst, they can derail your hard work in the gym (and on the trail). Salads, lean meats and smoothies don't keep well when all you have is a backpack and a frozen water bottle. So do you have to miss out on a fun weekend because you're trying to eat healthy foods? No way! You can have the best of both worlds. 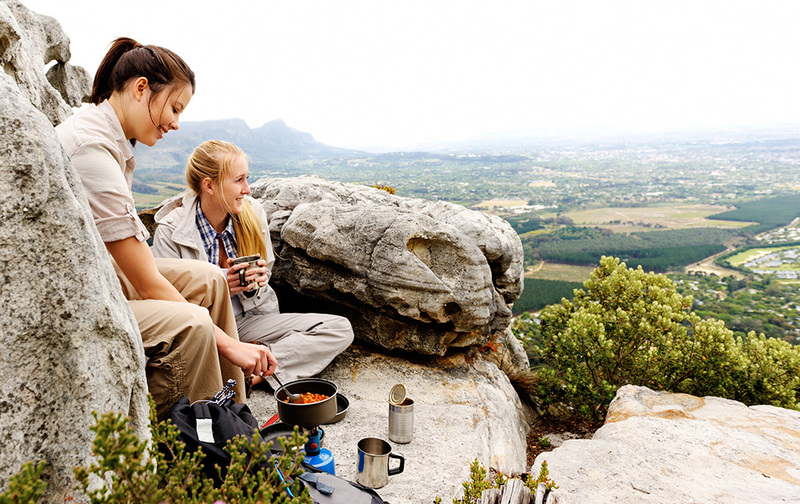 Enjoy socializing in the great outdoors and be your healthiest self with these nutritious meal and snack ideas for your next camping trip. Instant oatmeal packets aren't just packed with oats—they also pack in plenty of sugar and salt. Make a healthy version by portioning out quick-cooking steel-cut oats into baggies. Add dried nuts, seeds, and fruit. The fiber and protein will keep you satisfied and provide a slow and steady release of energy. My favorite combo is coconut chips, walnuts, hemp hearts, dried cherries, and cinnamon. Boil some water over your campfire and you're ready for a superfood breakfast! Look for brands that don't need to be refrigerated and you'll have something to put in your coffee or tea and to add creaminess to your oatmeal. Preheat your oven to 390°F (200°C) and spray a muffin pan with light olive oil. Finely chop a bell pepper, 5 cherry tomatoes and handful of spinach (uncooked) and add to the muffin tin. Beat together six eggs with 1/4 cup skim milk or unsweetened almond milk and spices. Pour into the muffin tins and bake for 15 minutes or until springy to the touch. Freeze the frittatas in a bag and eat the first day with whole-grain bread. If you don't have a cooler with you, bringing fruits and vegetables can be a challenge. Pack sturdier produce like carrots, celery, apples, and oranges that will be less likely to wilt or get squished. You'll need to eat any fresh veggies the first day so they don't get too warm. These tasty bars are made from fruit, vegetables, and chia seeds. That's it, that's all. Each bar has two servings of fruit and no added sugar. Super portable, these are a smart snack to carry with you for a boost of energy and nutrients. Legend has it that chia seeds were used by the Aztecs to fuel long expeditions. Put this ancient superfood to work for you! Snack on raw nuts and seeds for protein and healthy fats. Eating nuts can help control your waistline and promote a healthy heart—just be sure you keep the portion size to a handful or so to avoid overdoing it on calories. Looking for fiber and protein on the go? Roasted chickpeas and edamame let you enjoy the goodness of beans anytime, anywhere. Look for unflavored versions that don't have added sugar and that are lower in sodium. Packets of tuna or salmon, low-sodium beans, and nut butters keep well and give you the protein you need to power through your day in the great outdoors. Plus, sandwiches are super portable so if you're out on a hike, you don't need to rush back to the campsite for lunch. Brown rice cakes and whole-grain or seed crackers with tuna or nut butter are also perfect for lunch or a snack. Make a healthy turkey chili loaded with vegetables ahead of time. Freeze in a large bag and defrost in a camp pot over the fire for a tasty and nutritious dinner. These whole grains are super easy to cook when you're short on supplies and time. Pack them in bags with powdered herbs and spices. To cook them, all you need to do is add boiling water and let them steep. Bring some precooked frozen beans and spinach to serve with. Reheat in a camp pot over the fire for a delicious vegetarian meal. Another delicious make-ahead and freeze vegetarian recipe: Roasted Broccoli and Orzo with Lentils. Boil some brown rice or spelt pasta. Drain it and stir in some pasta sauce. Put this in bags and freeze before your trip. Bring along your rice or pasta bags, plus tuna packets and frozen peas. Freeze your burgers before your camping trip so they keep well. Grill over the fire with corn for a balanced and tasty dinner. Wrap apples in foil with cinnamon and cook over the fire. It's super simple but tastes just like apple pie—without the fat and empty calories.